BlueMark Innovations complies to the European privacy laws and is one of the PrivacySIG founders to guarantee the privacy of consumers. In the PrivacySIG strict guidelines have been prepared in a “Code of Conduct”. More information can be found at PrivacySIG.org. On this page you can unsubscribe your smartphone (opt-out) for our measurements. In this case, you will unsubscribe your telephone by all companies who are member of the PrivacySIG. The legal basis for processing WiFi/Bluetooth data is based on GDPR article 6.1: (f) processing is necessary for the purposes of the legitimate interests pursued by the controller or by a third party. The purpose of the WiFi/Bluetooth analytics is to analyse WiFi/Bluetooth signals in order to derive aggregated visitors metrics. We don’t conduct profiling on our collected data. 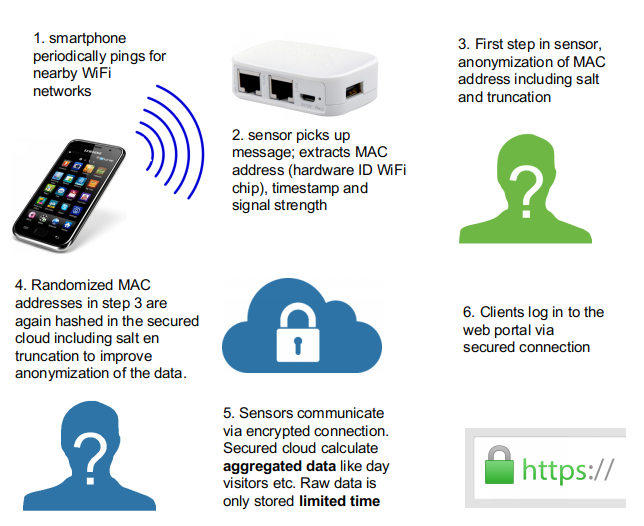 The involved personal data is the so-called MAC address; an unique hardware identifier of WiFi/Bluetooth hardware. We don’t store or process these MAC addresses directly, but instead pseudonymize/anonymize this data in the first step for our analysis. Also we only collect data that is needed for our analysis (minimum data collection). A simplified data flow of the WiFi analytics is shown below. The platform is a virtualized platform in which each client/projects runs a separate instance. This means that collected data is not stored in one global database, but instead in a stand-alone database per client/project. All servers of BlueMark are located in Europe. In the first step (step 1) the sensor picks up WiFi or Bluetooth signals. Immediately the MAC address are hashed, Default settings are SHA256 and truncation to 16 bytes and a salt. These information is stored in memory and transferred via a secure connection to our server. To increase privacy the hashed MAC addresses are again hashed (SHA256) with a random salt and truncated to 16 bytes. As each client/project runs its own instance of the portal with other hashing, collected data cannot be used in other clients/projects. The hashed MAC addresses are used to calculate visitor metrics, like average duration, daily number of visitors etc. Our clients can access data via our platform using a secure (https) connection. We don’t store real MAC addresses. Pseudomized MAC addresses are stored up to 90 days on our server. The reason is to be able to reprocess the data to derive visitor metrics with new settings such as a other signal threshold. Furthermore, we remove MAC addresses that are on the opt-out list from the privacySIG. Also we remove MAC addresses that are seen often or a long time (e.g. employees, local residents or nearby WiFi equipment). This is done via an automatic detection system. Removing those MAC addresses is performed by applying the same method of hashing and truncation to those addresses. Finally the sensor also has a privacy setting; only hashed MAC addresses are stored if the number of detected MAC addresses exceeds 2 in a period of 15 minutes (default setting). Privacy of consumers is important for us. 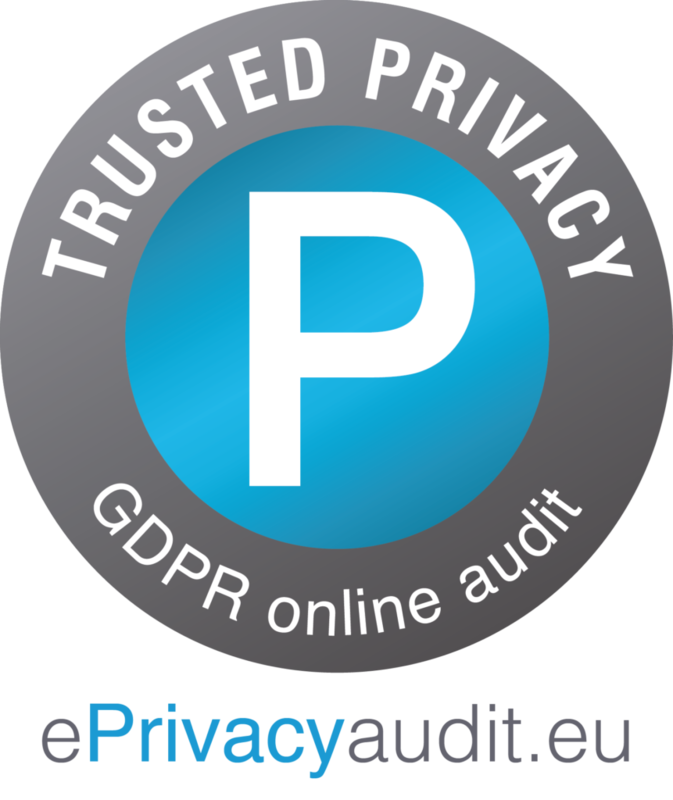 Therefore we have conducted PIA analyses using the online service of ePrivacy GmbH, an authority on privacy laws in Europe for technical products. Find here the so-called Threshold Value Report for our platform.. This website uses PiWik to collect anonymous visitor information and is stored on a server in the Netherlands. It collects non-personally-identifying information of the sort that web browsers and servers typically make available, such as the browser type, language preference, referring site, and the date and time of each visitor request. Purpose in collecting non-personally identifying information is to better understand how our visitors use this website. PiWik also collect potentially personally-identifying information like Internet Protocol (IP) addresses, but this information is anonymized. PiWik does not use such information to identify our visitors, however, and does not disclose such information, other than under the same circumstances that it uses and discloses personally-identifying information, as described below. Protecting customer data is for BlueMark Innovations important. We shall therefore ensure that potential personal information you provide, will be treated confidentially. BlueMark Innovations never gives details of customers to others and never sells or rents this information to others. For us, BlueMark Innovations BV, protection and privacy of your data is very important. The collection and use of your personal data is solely in the context of the legal provisions of the applicable data protection lay. With the privacy statement on this page, we will inform you what personal data is collected is and for which purpose the data is used. If you have questions or suggestions regarding data protection, you can contact via e-mail privacy@bluemark.io or by post via the above address. Of course, you have the right to receive upon request, information about the data stored by us on your person. Likewise, you have the right to correct inaccurate data, blocking and deletion. To do so, please contact privacy@bluemark.io or by post to the above address. Protecting customer data is for BlueMark Innovations BV paramount. We shall therefore ensure that the personal information you provide, is treated confidentially. We never give details of customers to others and never sells or rents this information to others.